I love floral scents. I’m a sentimental, a romantic. I know. 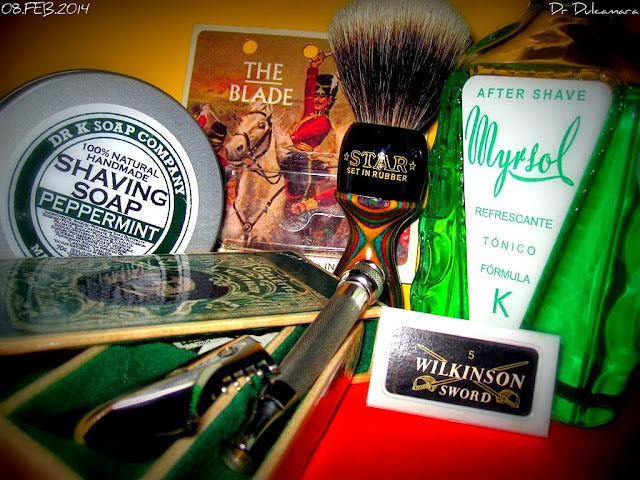 I love soaps and shaving creams with these scents. Simple, single flower, but also complex mixtures of sublime aromas of the best flowers. During its presence in shaving, they transported me in time and space up to the most unique places on earth. Ah, is something that is hard to describe, friends. The flowers, or you like or do not like, and I like them, I love them. After this introduction you will think that the Good Doctor has gone mad. It is possible, but it is also possible that already was before. 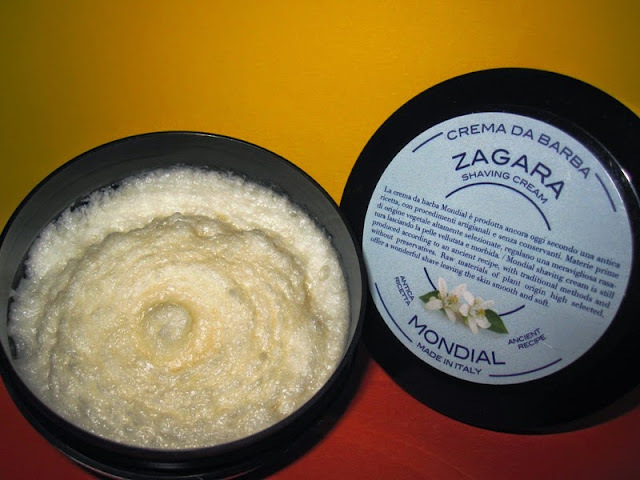 Our good friend, Mrs. Lorena Mateu, alma mater of Gifts & Care is aware of my tastes, and before holidays, she sent to me this travel jar of shaving cream MONDIAL ZAGARA, 75 ml. So I took it on vacation. Here you can see it has a texture and consistency typical of Italian creams, which are rather morbid soaps. 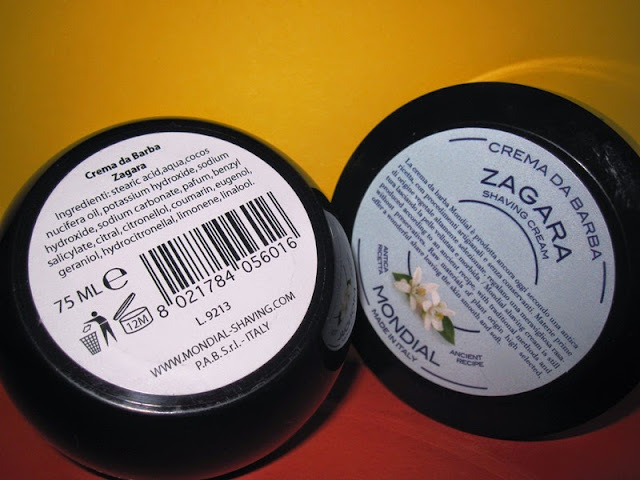 They are not like those creams of tube, the brush is loaded directly inside the jar as being soap bars. You can see the ingredients on the back label. ZAGARA: A real elixir of pleasure. Extracted from orange and lemon flowers, it is a thick and lively fragrance, a mature and balanced petit grain brought into harmony with the euphoriant charm of jasmine flowers and a with a small note of very precious roses. 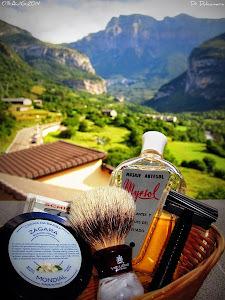 The experience of a new shaving will be a concert of olfactory sensations able to give you a deep serenity. Hey, the paragraph is nice, it almost seems written by me. I liked it a lot. The floral aroma of this blend of orange blossom, jasmine and rose scent is complex and subtle, with a moderate, I would say, but very elegant, intensity. The mixture of these flavors is very well made. I was delighted. If you like flowers, go ahead, do not doubt, try it. The properties of the lather obtained with this cream are good. I load the brush a lot. Note that this jar is small in diameter, intended for traveling, but there are larger ones. I load the brush for a minute or almost. Rather than loading, it is already starting lathering. Then, I lather in face and often I reload about 15 or 20 seconds, and go again to lather in face. With this cream I get a good foam with the thickness I like, that greatly facilitates the sliding of the blade. During retouches I’m getting it from side to side with my left hand so that the blade always slide over lather, and I can corroborate that lubricates well. 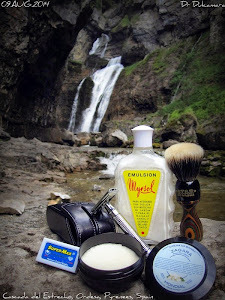 At the end of shave, I extend in face the remaining lather, and left a minute, as a final hydration. You know that the lather that is often left on the brush is dense and creamy, and this way the face is quite well prepared after rinsing, to accept the after shave. And what did this summer? Well, as I said earlier, I bring it on vacation to see how the scent smells in different places. And I can say that in the central Pyrenees, Valle de Ordesa, Huesca, it smells good. In the photos above, you can see it in Torla, on the window of my bathroom, with Mondarruego Peak, and perfuming the Estrecho Waterfall in river Arazas. Also in the French Pyrenees, in the Lac de Gaube, in front of Vignemale Peak, I can confirm that it works, and to leave no doubt, I took it to an island. Not on a desert island, but Mallorca. And here at Cape Formentor, you can also see it at the Mediterranean sea. There’s a better place? Greetings from your friend, the Good Doctor. Electric Shave. Here we go with science. 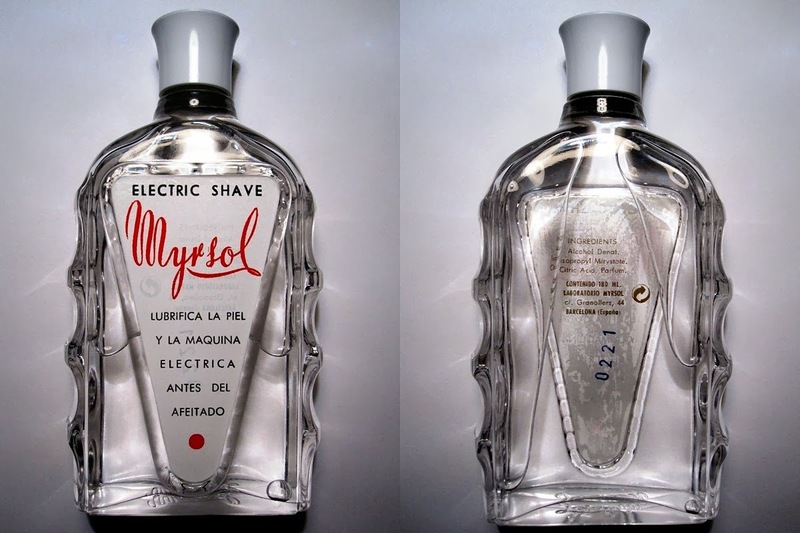 Smells good, looooong better than other product for electric shave. I wanted to try it as a pre-shave, but for wet shaving, not for electric shaving, just for curiosity. To see if it was useful or not. Men, this product has nothing glamorous. At hands, it glides a lot. An strange, rare feeling at hands. It is absorbed or evaporated quickly. I think it must take a lot of alcohol. The formula is very simple. Provides an interesting freshness that lasts a long time. The face and hands were left with a feeling of interesting slip, but when dry, apparently there was no greasy film. This feeling was a bit strange for me, I usually not use these products, or other pre-shave products. Some weeks ago, with 36 hours beard, I proceeded to try it as pre-shave. In half face. The right side. I usually shave in the shower, I’m a “shower shaver “, but that day I did out after the shower, in front of the sink and mirror, to check everything well, and for the product does not wash with shower. 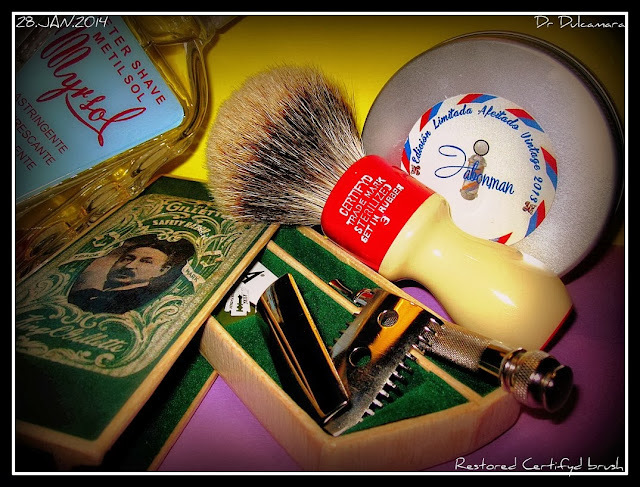 I selected the gorgeous L’Occitane Cade soap, and a couple of brushes that I just restored. A brush for each half of the face, for not to contaminate with the product, and the test was better. Both Finest Badger knots, but from different suppliers. 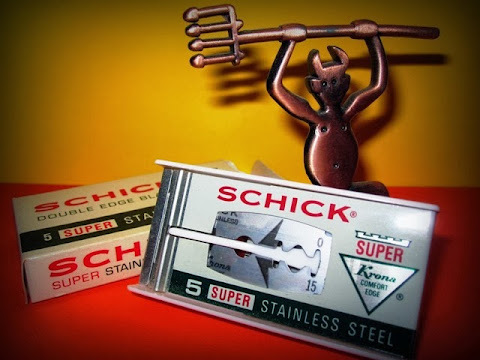 Regarding the blade, I selected a Schick Super Krona from my friend Lambretto, which is not the smoothest one, or the sharpest one of which I have, but which provides a performance in the average or slightly above the average. The razor , the very reliable Weber ARC, a brilliant razor, which shaves closer with great smoothness, which makes good even to the bad blades. With UFO TiTAN handle. So with all the equipment in front of the sink, Sunday morning, unhurried, massaging myself with Electric Shave in half face, lathering the other half face while it evaporates. The freshness of the product was clearly seen . Finally, lathering the half face with Electric, and going to shave. My passes as I usually do . A razor edge for each half-face, not to invalidate the test. First pass, second lathering, second pass, third lathering bottom of the face, and last pass and retouches in difficult areas, changing directions, leading the lather with left hand from one area to another. 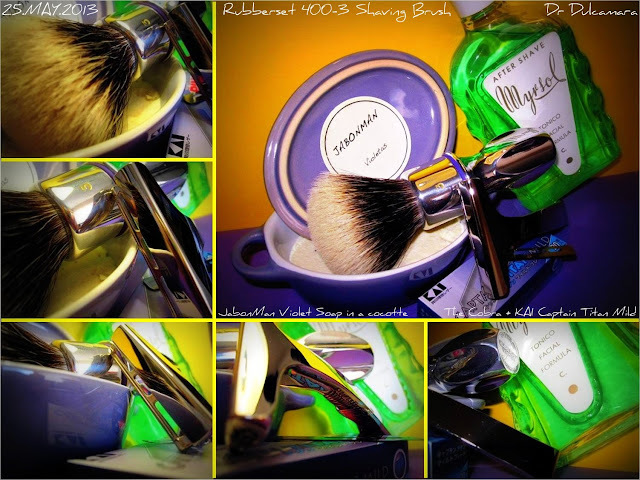 Very good shave, BBS. Although I like most in the shower. But doing it in the mirror without water running down my back had allowed me to hear the sound of the Weber haircut. Normally the sound of the water in the shower does not permit that. On the product tested, the Electric Shave, I had not noticed significant differences in one half of the face versus the other. I did not know if there were, but I had not noticed. It must be said, a nice freshness, it did not spoil the foam, since it had evaporated quickly and you can lather the same way as it is not a greasy film . But I had not been able to find differences about slip issue. Finally, I applied a generous dose of Agua Balsamica and then I felt I was in heaven, in a Mediterranean heaven. I touch my face and yes, maybe I noticed a little softer half face in which I had applied the Electric Shave, but the difference was very subtle, very subtle. I tried it with both hands, and corroborated it, a little softer the half in which I applied the Electric. But was not determinative, it was not scientifically proven, perhaps suggestion, because I had called my little son, who knew nothing of the test, to pass his hand over my face and he said I had softer the half face on I had not applied the product. You see. This is what I got. 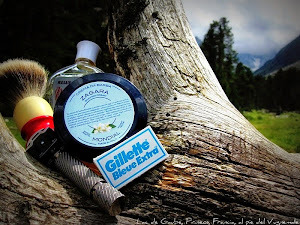 I do not think it will be a product that I will use a lot, because usually I do not use pre-shave products. But I know who to give it away. Kind Regards. The Good Doctor, your crazy friend. PS: In next posts maybe you can meet Mr Miquel Ricou. Well, this series of posts is taking me a while, but we are already ending. Formula K. This is great for summer. Peppermint at its finest. As a drink of Peppermint on the rocks. Pairs well with Peppermint and Rosemary Mike’s soap, and a some time ago I have found the perfect partner for it. 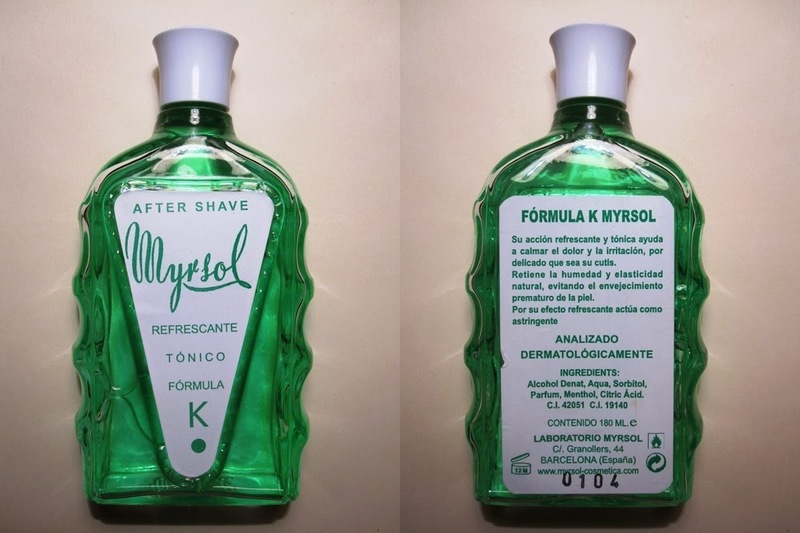 I bought a peppermint soap that makes an spectacular lather, and the funny thing is that is Dr K. Yes, Dr K. Ha ha, Dr D (abbreviated as some people do) shaves with soap from Dr K and uses aftershave Myrsol Formula K! And the brush in the pic is a Star Kambro restored by El Druida for me. Ha ha, a Kambro. All with K! What the heck! The Good Doctor! Is crazy! 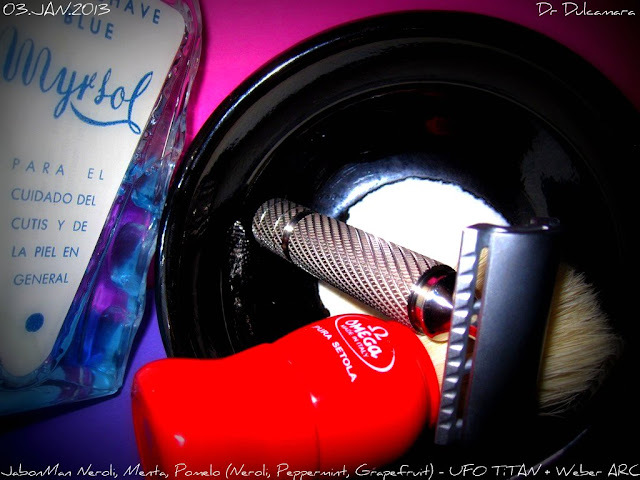 One of my shaving pics, and science. 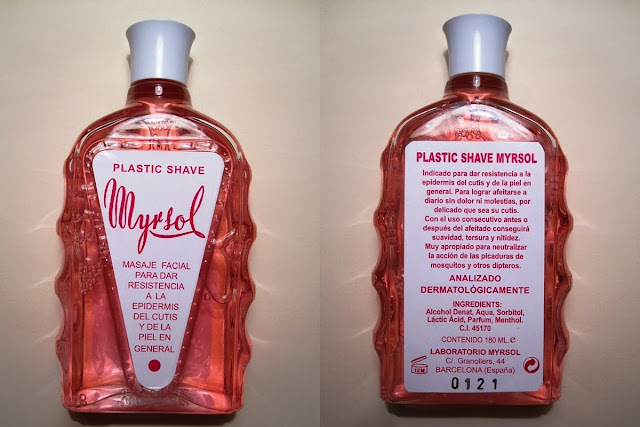 PS: Next post will be about Myrsol Electric Shave. Formula C. Probably my favorite, just probably. I like floral scents. With due respect to all opinions, to me this smells like violets. No to lilacs. To violet. 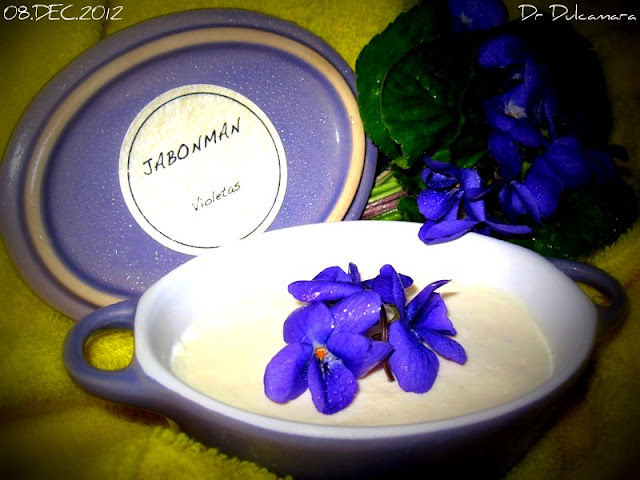 Shaving with Jabonman’s Violet soap and splashing with Formula C is an extrasensory experience. Try to throw a generous splash, chest and back also. Menthol will make his job, and you will feel like a Marvel superhero, invincible. Go out the front door, and conquer the world. Violets and its perfume are not fashionable, perhaps they are a bit old-fashioned. When I had to shoot this pic I had to order the flowers in my flower shop. They said there were only a wholesaler that carried them in Barcelona. Come on, you who continue distracted. I put the picture of science. Fix your attention. 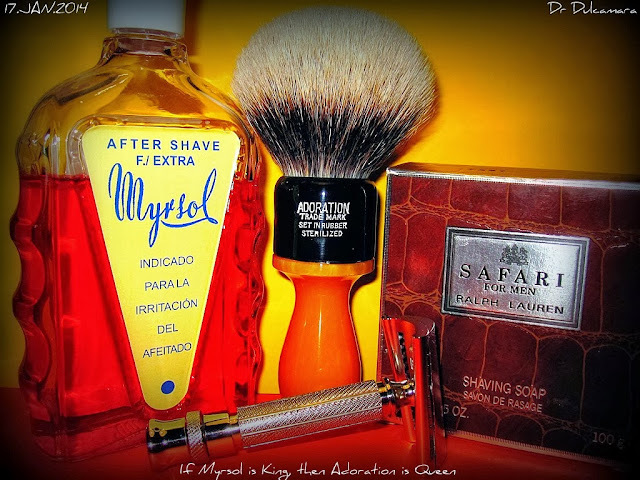 PS: Next post will be about Myrsol Formula K.
Myrsol Blue. Ah, great! Pay attention, please. with a dip in Myrsol Blue you can go as a true gentleman to a party at the Ritz or the Renaissance, with tuxedo suit, the Patek Philippe at wrist, and a sophisticated partner, bejeweled with simple elegance, dizzying cleavage, wasp waist, and shapely thighs on stilettos. Upon entering the room, all men will distract with your partner and you’ll capture the attention of the women, by the sublime aroma of Myrsol Blue. Gentleman at his finest. You will blow like a blowfish. Self-esteem skyrocket. You’ll feel the King. 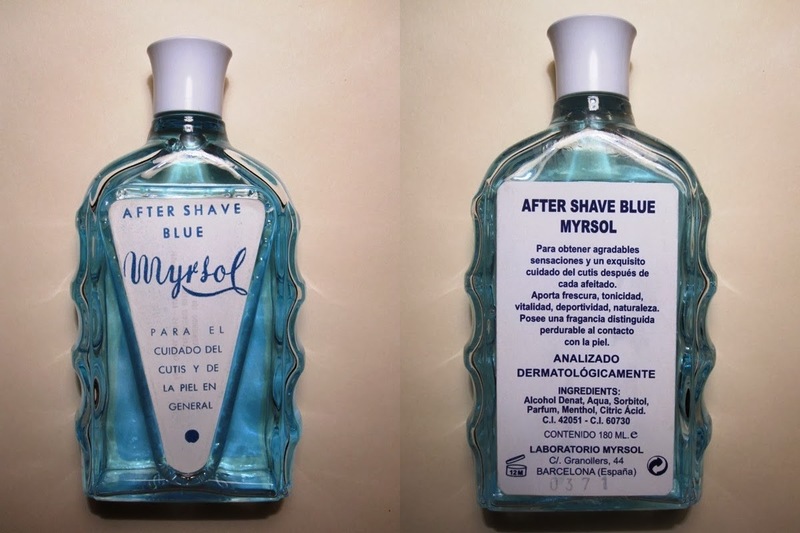 If you like other blue after shaves, you will like Myrsol Blue. But it’s not the same. This is blue too, but it plays in a different league, the Champions League of the After shaves. It is quite similar but quite different. It is infinitely better, very classy! Come on, enough of poetry, tales of princes and cinderellas. Science. There it goes. 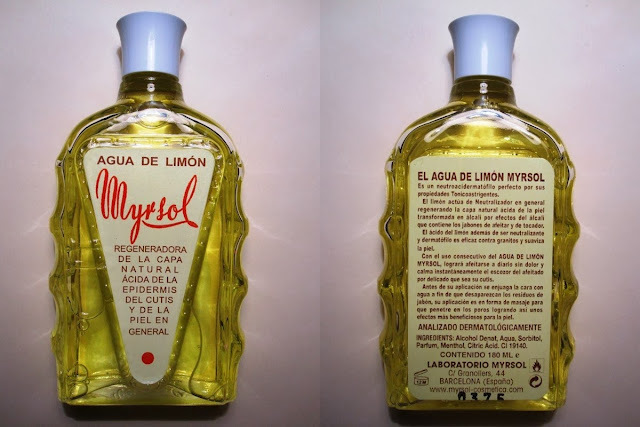 PS: Next post will be about Myrsol Formula C.
Agua de limon. That is, lemon from the lemon tree. You have to like the lemon smell because it is not a little. For oily skin, Mr. Miquel dixit. Read the label, which is priceless. 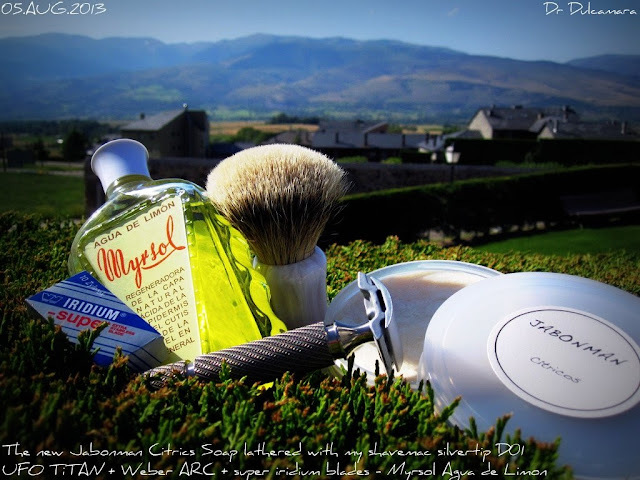 PS: Next post will be about Myrsol Blue. Formula EXTRA or F/EXTRA is something sweet. 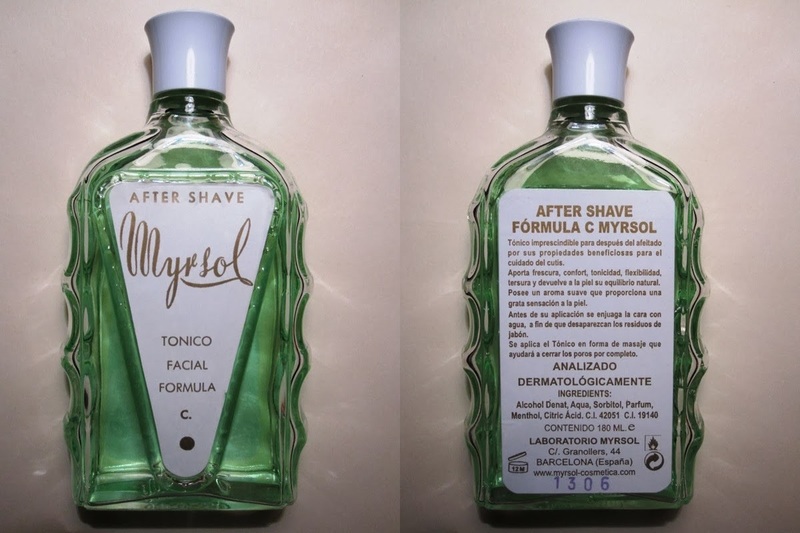 If you like old barbershop scents, you will probably like this one too. But it’s not the same. Not smells exactly the same. This is better. This is more classic, more subtle, more elegant. Ideal for applying generously, and going elegantly dressed with your linen suit to a wild night of Danzon in Havana, surrounded by females in their majestic caribbean splendor. Or leaving home by morning with a generous application. Go into the elevator of the office with a few ladies. Watch their reaction from the corner of the eye. Ha ha, I have enabled you. I know some of you, guys, are going to do this experiment. 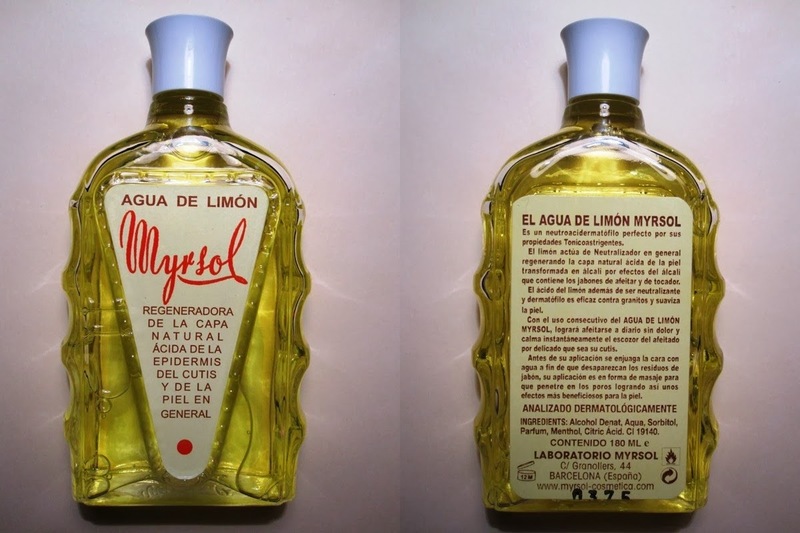 PS: Next post will be about Myrsol Agua de Limon. Plastic Shave. This is absolutely stunning! Look, it was not love at first sight. The first few times I used it, I was not felt in love with the aroma. Kind of odd. Sometimes it seemed very artificial. Sometimes a mixture of roses and talc. Old smell. But gradually it has become a “must”. I can not live without it. It is the only one with lactic acid. It gives to me a silky smooth face, or at least what I think. It is named Plastic because it has keratoplastic effect (someone can explain it, please) but it was not convenient or they not let Mr Miquel putting that word in a cosmetic, it was reserved for the pharmacopoeia. By that, he named it Plastic. It says that neutralizes bites of mosquitoes and other diptera, oh! For going to the jungle! Tarzan uses it! 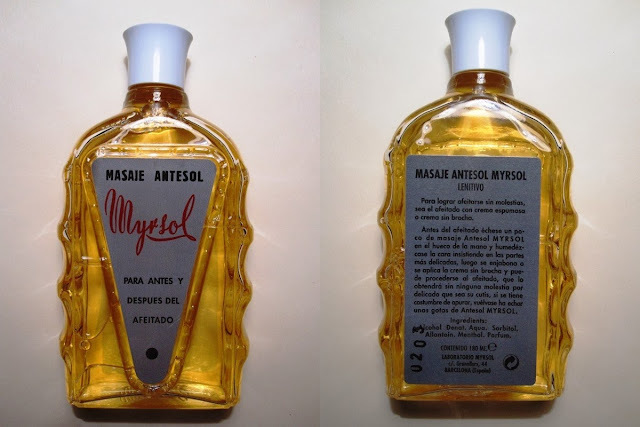 This product is the second product made by Mr Miquel in the early 40s. He made it for his personal use. Mr. Miquel has an extraordinary face skin. 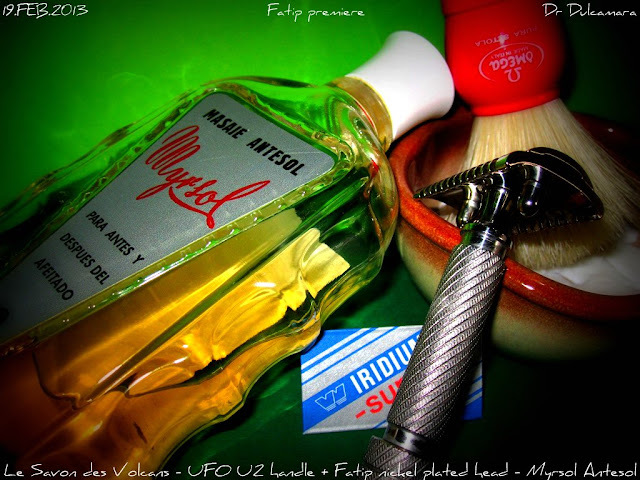 All his life shaving with the Emulsion, without shaving soap, and using Plastic Shave. And you can see him, 94 years old and going dance twice a week, he still drives his car, and the ladies usually comment about his face skin in the ballroom. It will be his secret to youth? If so I’m going to drink one cup every night, before going to sleep, ha, ha. Please do not drink it, my friends. Just kidding! Ah, I forgot to say. About the aroma, smeared of Plastic Shave you can go quietly to the clinic to visit a former girlfriend who has just become a mother, with a bouquet of flowers in your hand, giving her a brotherly kiss on the cheek with a delicate scent of talc and roses in your smooth face, while you tell her how lovely is her baby, and to the father that obviously the child is his, no doubt, due the resemblance, ha ha! No kidding now, friends! PS: Next post will be about Myrsol F/EXTRA. Antesol is King! Absolutely! What the heck! Elegant barbershop scent! It can be used as PRE and as AFTER shave. The only one with allantoin. Oh guys, yes, allantoin, the miracolous ingredient! It increases the smoothness of the skin, promotes cell proliferation and wound healing! Antesol is a “must”! Can not be without it. It says it’s soothing. 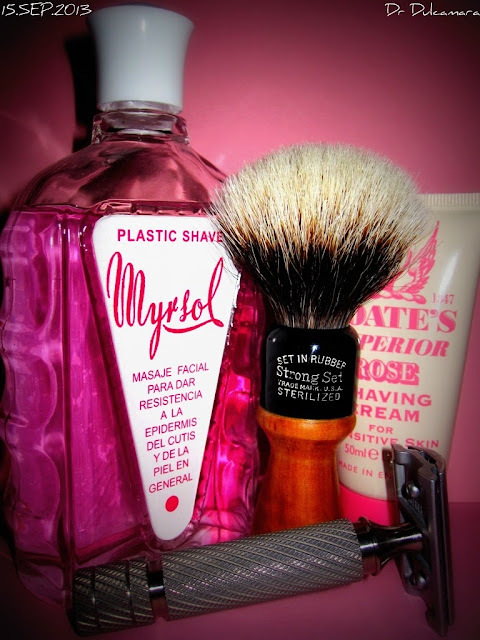 PS: Next post will be about Myrsol Plastic Shave. 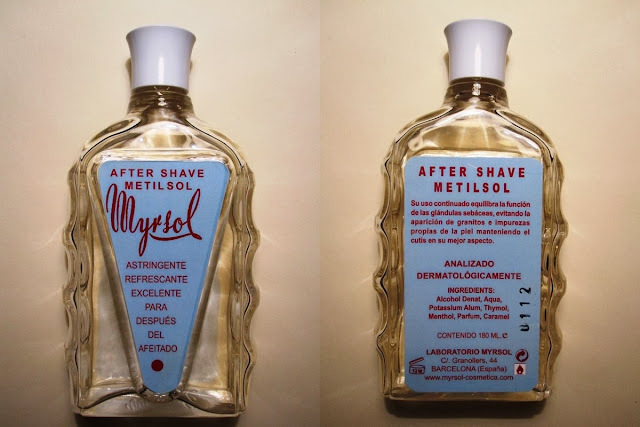 Metilsol, the great unknown along with Plastic Shave. This is astringent, due to the Potassium Alum. It is an astringent/styptic and antiseptic. 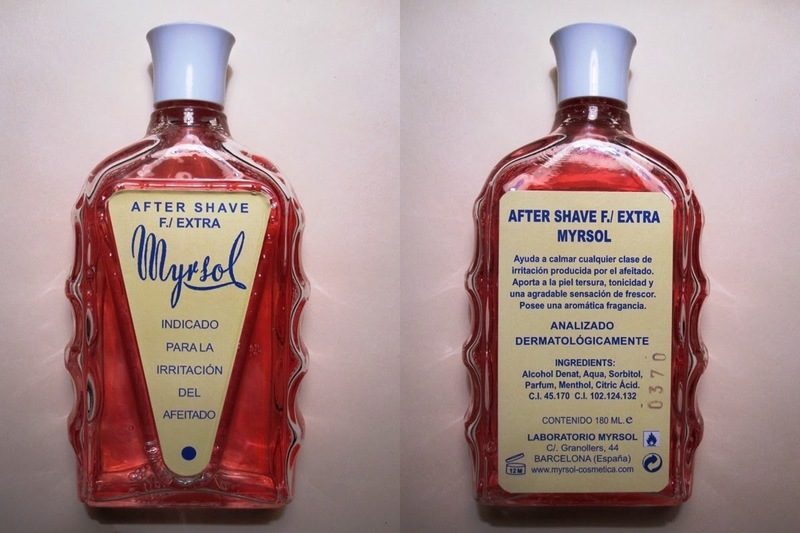 Often used as after shaving to prepare the skin, and to reduce bleeding in minor cuts and abrasions. Thymol (used by The Ancient Egyptians and in the Ancient Greece) has antibacterial and fungicide properties. It is an anaesthetic, and used as an antiseptic in mouthwash and some toothpastes. Scent very similar to Agua Balsamica, but slightly more medicinal. Probably it is the one that I use least. PS: Next post will be about Myrsol Antesol.